Here on our website we talk about million of top speed and legendary cars, but today we’ll be talking about one made for those who keep the peace by chasing and fighting those who always chose the best car to escape. 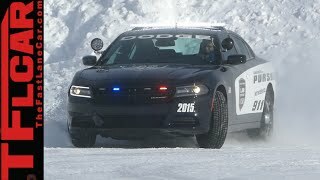 We are talking about the Dodge Charger Pursuit 2015, a police cruiser which has sufficient power and features inside to bring the perps to justice. 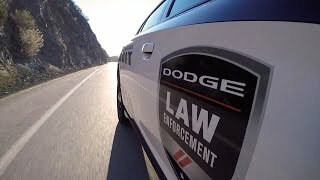 Let us not waste more time and have a descriptive look at the new Police cruiser from the house of Dodge. Interior of Dodge Charger Pursuit 2015 will bring first to your notice its center console which now replaces the civilian version. The center console now can house in it radios, scanners and everything a cop need till the controls of radar and sirens. While Dodge gave space and power to mount all these it has also maintained cleanliness by hiding the extensive wiring harness, which includes 12V adapter for other equipments. Seats have been prepared keeping in mind the massive utility belts officers usually wear. To give complete control steering wheel is given thick-grip with controls over numerous features and beside it is located a Chrysler 5.0 inch Uconnect touchscreen over dashboard, giving a view at the rear through camera and also providing vital informations related to vehicle with sufficient entertainment supportive features. 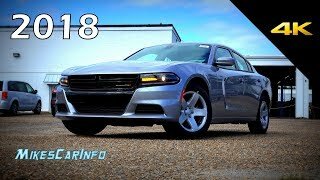 Exterior of Dodge Charger Pursuit 2015 too holds some vital changes that make it different from the civilian version. At the front fascia of Dodge Charger Pursuit is a lower hood and grille, more streamlined to bring an aggressive look. There is also an added bumper to protect the grille. More in front fascia includes A-Pillar spotlights, wig-wag lights and roof mounted horizontal light bar. 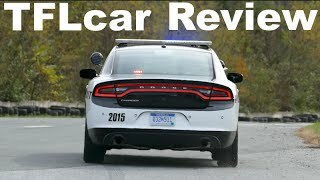 Moving towards the rear face of Dodge Charger Pursuit 2015 are taillights with racetrack like features while the decklid comes with mounted emergency lights and the same wig-wag lights incorporated in taillight. 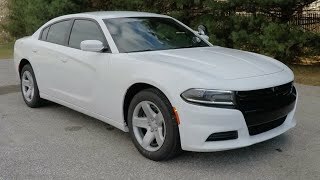 Dodge Charger Pursuit 2015 comes with two powertrains option; first being a less powerful 3.6 liter Pentastar V6 engine delivering total output of 292 hp and peak torque of 352 nm while second being a ferocious 5.7 liter HEMI V8 engine delivering total output of 370 hp and peak torque of 529 nm. Both these variants are mated to five speed automatic transmission. Though no performance specifications have been revealed about the former latter is capable of reaching 60 mph from standstill in just 6.0 Seconds. We believe it’s powerful enough to chase the culprits.